Are Solid Rivets Right for your Project? In choosing the right type of rivet for your needs, it is important to have a good understanding of the various types of rivets available. Various types of rivets are designed to meet different accessibility, cost, and strength requirements. Among the many types of rivets are solid rivets. While solid rivets are ideal for many projects, they may not be the best choice for all projects, making it crucial to understand more about these types of rivets. Solid rivets are comprised primarily of a shaft and a head that is deformed using a rivet gun or hammer. A crimping tool or rivet compression may also be used for deforming solid rivets. These types of rivets are commonly used in applications in which safety and reliability are essential. The structural elements of aircraft are among the most common places where solid rivets can be found. Modern aircraft often uses hundreds of thousands of these types of rivets. In selecting solid rivets for your project, it is important to understand that such rivets typically come with rounded or universal heads, or countersunk heads. A variety of materials may be used for the production of rivets, including aluminum alloys, nickel-based alloys, or titanium. Due to the fact that aluminum alloy rivets may be too difficult to buck, they may need to be softened through an annealing process prior to being bucked. Aluminum rivets that harden with age are known as ice box rivets because they are annealed and then stored under sub-freezing refrigeration, a process that slows the age hardening process. Solid rivets constructed from steel are also available and are common used in cranes, bridges, and building frames. It should be understood that with solid rivets, access to both sides of the material is required. Pneumatic, hydraulic, or electromagnetic driven tools may be used for driving solid rivets. In selecting solid rivets, it is important to ensure that the supplier you select has specific experience in manufacturing quality solid rivets. 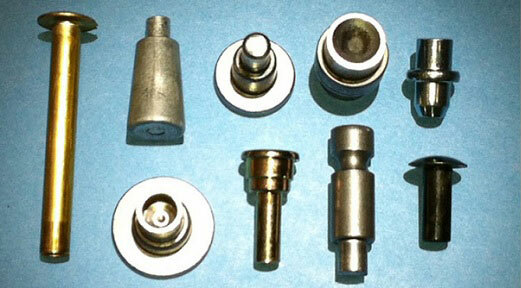 It is also a good idea to inquire as to the types of materials available for the production of solid rivets.